From the viewpoints of saving energy resources and prevention of global warming by means of CO2 reduction, etc., an increase in the efficiency of gas turbine engines that are used in combined power generation and jet engines, etc. is always required. In order to increase efficiency, a rise in combustion gas temperature is effective, and for this purpose development of turbine materials having high strength at high temperatures as well as excellent anti-oxidation performance and fatigue characteristics is required. The group from National Institute for Materials Science (NIMS) headed by Dr. Harada has been tackling this issue for many years, and has developed a superalloy whose main constituent is Ni by utilizing a huge database. This alloy has a basic structure which is conformable texture consisting of 2 phases, i.e. the γ-parent phase (f.c.c. structure) and the γ'-phase of Ni3Al intermetallic compounds (Ll2 structure). The features of the developed superalloy include not only the increased durable temperature by the addition of elements having a high melting point such as W, Ta, and Re, but also elimination of grain boundaries by single crystal solidification, whereby deformation or fracture by grain boundary sliding has become unlikely to occur. In addition, the durable temperature has been increased by developing an EQ (Equilibrium) coating that enables the anti-oxidation performance of an alloy to be improved and at the same time suppresses diffusion. The patents on the superalloy whose main constituent is Ni have already been licensed to aircraft engine manufacturers overseas, and have been commercialized in the jet engine of Boeing 787, a highly efficient new type of aircraft. Such a situation is almost unprecedented, and is an epoch-making one. This result is expected to be applied widely in future further to jet engines and many gas turbine systems, and has an extremely great impact on the industries. Due to the aforesaid reasons, the three researchers, Dr. Harada, Dr. Kawagishi, and Dr. Yokokawa, will be awardees of the 13th Yamazaki- Teiichi Prize in the field of materials. In recent years from the viewpoints of prevention of global warming and saving fossil fuel, higher performance of and an increase in the efficiency of jet engines and gas turbines for power generation, etc. are earnestly desired. In order to increase the efficiency of gas turbine engines, a rise in combustion gas temperature is effective, and it is essential to develop heat resistant materials that have greater high-temperature strength and excellent anti-oxidation performance and fatigue characteristics. At present γ' precipitation-strengthened nickel-base superalloys (Ni-base superalloys) are used as high-temperature and high-pressure parts for gas turbines. In order to improve heat resistance of Ni-base superalloys, more than 10 types of elements such as Al, Cr, Mo, W, Ti are added, and in recent years, rare earth elements and platinum group elements, etc. such as rhenium (Re) and ruthenium (Ru) are also added. For these reasons, development of new alloys by using conventional metallurgical methods was not an easy task because such methods required many experiments and entailed a lot of labor and cost. Ni-base superalloys have a basic structure which is conformable texture consisting of 2 phases, i.e. the γ-parent phase (f.c.c. structure) and the γ'-phase of Ni3Al intermetallic compounds (Ll2 structure), and demonstrate excellent high-temperature strength through precipitation of the γ'-phase into the parent phase. Also, their strength is further increased by elimination of grain boundaries by means of single crystal solidification. Dr. Harada and his group have successfully developed single crystal superalloys that have durable temperature (the temperature at which the superalloy withstands creep under a stress of 137 MPa for 1000 hours) exceeding 1100℃ for the first time in the world based on an unprecedented alloy design policy that increases the difference in lattice constant between the γ-phase and γ'-phase by means of the added elements and promotes deformation of the cubic γ'-phase into plate-like texture that is called the raft texture under the stress as shown in Fig. 1 and at the same time that prevents movement of dislocations that cross the interface between the γ-phase and γ'-phase by miniaturizing the dislocation network that occurs on the interface (Fig. 2). Also, they succeeded in development of alloy design programs that predict the composition of the γ- and γ'- phases, the amount of γ'-phase, creep strength, etc. by obtaining distribution of the added elements to the γ- and γ'- phases based on the composition of the constituent phases and measurements of the amount of γ'-phase. In addition, they developed an epoch-making technique called the EQ (Equilibrium) coating that enables the alloy to demonstrate anti-oxidation performance and suppress diffusion at the same time by using materials that achieve thermodynamic equilibrium with alloys. 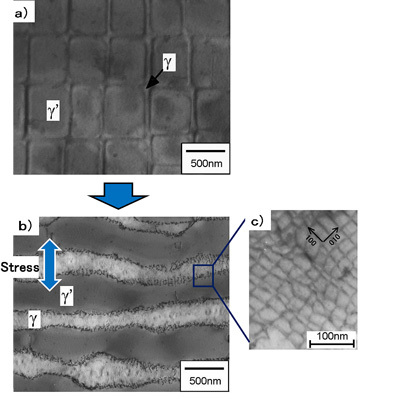 To increase high-temperature strength by promoting deformation of initial texture (a) into raft texture (b) under creep stress at elevated temperatures and at the same time by creating a miniaturized dislocation network on the interface between the γ-phase and γ'-phase, thereby preventing movement of deformation caused by dislocation. The durable temperatures of Ni-base superalloys have improved with changes in manufacturing process from conventional casting (CC) through directional solidification (DS) to single crystal (SC). The National Institute for Materials Science has successfully developed alloys that have higher durable temperature than that of prevalent alloys. These results have been patented, and have already been licensed to aircraft engine manufacturers, etc. in Japan and overseas, and have been introduced in a full-fledged manner, and a further increase in efficiency is being pursued (Fig. 3). As for examples of licensing jet engine materials patents to manufacturers overseas, there have been hardly any such examples even including those of heavy industry manufacturers, etc. in Japan, which is an epoch-making situation. The results not only enable jet engines to attain higher efficiency and their fuel consumption to be reduced, but also realize Japan's participation through technology for the first time in the market of aircraft jet engine high-temperature parts through their materials in which Japan has fallen behind after World War II and the effects of such falling behind others are still dragging on, and it can be expected that Japan's aircraft industry will play a leading role and consequently there are great benefits that a path toward jet engines manufactured in Japan will be opened. Also, there results are expected to have very good prospects that become key technologies toward the realization of gas turbines for ultra-high efficiency combined cycle power generation of a class in which the combustion gas temperature exceeds 1700℃ which is the highest in the world (cooperation with Mitsubishi Heavy Industries: a NEDO research project for the commercialization is currently under way), with which it can be expected that there will be a substantial reduction of CO2 emissions from power generation facilities that account for 1/3 of Japan's total CO2 emissions. 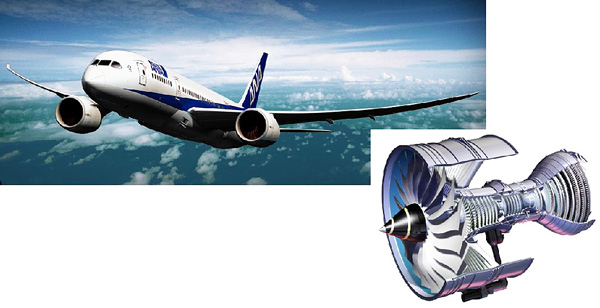 The developed alloys have been commercialized as the most important parts of the Trent 1000 jet engine for the highly-efficient state-of-the-art aircraft Boeing 787.